You’ve heard of the famous temples, but did you know that Java Sparrow nest on one of them? Also some quality forest and shorebird action nearby. One of the main interests here is Indonesia’s most reliable location for seeing the increasingly rare Java Sparrow. Birds nest on the stone temples at Prambanan, around 15 km east of Jogyakarta city. The best place to try is the Roro Jongrang temple buildings, that form part of the wider Prambanan complex, and in particular the Shiva temple. Here several pairs of Java Sparrow reliably nest within cracks in the temple structures and even in artificial nest boxes. Malioboro Stree lies in the heart of Jogja city. Mostly famous for its shopping it is also one of the few places where you can see nesting Java Sparrow, while in season (September-December) it supports a huge roost of both Barn Swallow and Daurian (Purple-backed) Starling. The Starlings are sometimes seen flying over the city during the daytime. The Java Sparrow can be found at the Melia Purosani Hotel where they have a conservation program to protect the Java Sparrow’s nesting places on their building. The sparrows can often be seen in the morning or afternoon on the high balconies on the hotel’s northern side, or in the tall trees along the hotel boundary. Be a little careful using binoculars and cameras here so you don’t disturb the hotel’s guests! Javan Myna and Javan Munia have also been recorded here. Further along Malioboro Street, near the big intersection with the museum, castle and old post office is a good area to look for roosting swallows and starlings. Occasionally Peregrine Falcons are seen here also, looking to prey on the swallows and starlings! Located around 20 km from the city centre, Merapi National Park surrounds Sunung Merapi, one of the most active volcanoes in the world (usually erupting every 2-3 years!). Despite recovering from a damaging eruption in 2010, it still remains an excellent place to go birdwatching. There are three main paths that provide good access to the forest: Tlogo Putri; Tlogo Nirmolo, and; Turgo. The first of these – Tlogo Putri – is the easiest to reach, and is the entrance gate to the park, but the path is in poor condition with several dangerous cliffs (nice if you like a bit of adventure!). To access the trail take a small upward path on the left side just after the ticket office. 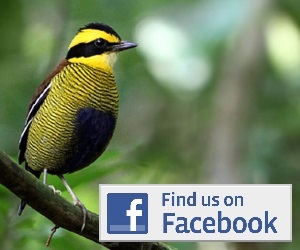 Look out for Javan (White-crowned) Forktail, Pink-headed Fruit-dove, Black-naped Fruit Dove, Javan (Chestnut-backed) Scimitar Babbler, Orange-spotted Bulbul, White-flanked Sunbird, White-bibbed Babbler and Javan Hanging Parrot. At the end of the track you will come to a junction and from here you can choose if you want to continue struggling up to the peak of Plawangan Hill or to continue at a more easy pace on the good condition path between Goa Jepang and Tlogo Nirmolo (see below). The second path is Tlogo Nirmolo, about 3 km from Tlogo Putri. The path from here is a good location to see Javan Whistling Thrush, Javan Fulvetta, Sunda Minivet, White-flanked Sunbird, Javan Hanging Parrot, Javan Bulbul, Crescent-chested Babbler and Javan Heleia. The path is linked to the trail to ‘Goa Jepang’; a series of 18 caves made by the Japanese Military before Indonesian independence. After the caves the trail continues a short distance and this can be a good area to see Black-banded Barbet. Don’t go too far however, as the trail ends in a steep cliff. The third path is the most difficult, at Turgo Hill, separated from Plawangan Hill by a big lava-flow river. This path is steep and slippery with less vegetation, but also the best place to find Javan Scimitar Babbler and to see the raptors, both resident and migratory. This is probably the best place to see Javan Hawk Eagle, although they could be seen anywhere within the park. Trisik Beach lies around 30 km south of the city centre, at the estuary of the Progo River. While the beach itself is not one of the best, the lagoons and fields behind it are one of Java’s premier shorebird spots. Previous records here have included Grey Phalarope (Indonesia’s first record) and Nordman’s Greenshank (Java’s only record). Other birds regularly seen here include Christmas Frigatebird, Javan Plover, Cerulean Kingfisher and many regular species of waders. There are three primary areas for birdwatching: The paddyfields, the estuary, and the beach and lagoon. To access the lagoon you should pay Rp 3000 per person to the local warden. The paddyfields can be accessed by walking along tracks near the lagoon. The estuary can be accessed from the end of paddyfield track. Birdwatching is probably best during the northern winter months when the number of migrant waders is at its highest. Ngongap is a beautiful beach around 60 km south-east of the city. The clifftop scenery is awesome and home to roosting (and maybe nesting) White-tailed Tropicbirds. Most of them come from lepturus race with pure white breast, but sometimes the fulvous-breasted fulvus race from Christmas Island also appears. If you are lucky Greater, Lesser and Christmas Frigatebird can also be seen out to sea. Other birds in the area include Pacific Reef Egret, Sacred Kingfisher and Whiskered Tern. Jogjakarta (or Yokyakarta) is one of Indonesia’s most famous tourist destinations, on account of its fascinating history and culture and world heritage status temples (including Prambanan and Borobodur). As a consequence, getting there is easy, finding accommodation is easy, and getting from the city to Prambanan is easy. Just choose accommodation that suits your pocket from any guide book (such as Lonely Planet) and then ask your hotel about a tour or transport to Prambanan. Malioboro Street is even easier, as it lies in the centre of the city. Merapi National park can be accessed via the park entrance at Tlogo Putri; reached easily by public transport from Jogja city. Get first to Jalan Kaliurang and then take a bus going to Pakem. From there catch another bus going to Kaliurang and get off at the Tlogo Putri terminal. One nice option to stay overnight is the Paraksari Hotel at Pakem, at around Rp 150.000 for a room with AC and hot water, the birdwatching is interesting around the hotel (Javan Kingfisher, Collared Scops Owl) and it is only 30 minutes from the park entrance by bus. There is no clear public transportation to Trisik Beach, but with a car or motorbike the area can be accessed easily enough. The trails can be a bit confusing so you may consider asking a local for assistance as a guide. As with Trisik Beach, getting to Ngongap is not straightforward by public transport, however if you have the use of a car or a motorbike it should be relatively easy. The drive is around 60 km (2 hours) south of the city centre. The closest accommodation is at Sundak Beach, a beautiful beach about 15 km from Ngongap. Top tip: If you are a nervous flier, get an early morning flight in and out of Jogjakarta, as it is notorious for having a short, bumpy runway and big afternoon thunderstorms! Information on this page is contributed by Panji Gusti. Scroll down the page for related information, including photos, comments, trip reports, guides and services, articles and news. . If you can update this account, or find things have changed, please add your comments below to make it easier for the next person. Thanks! 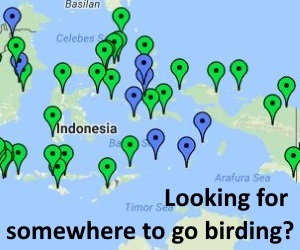 You can see the birding tour guide in burung nusantara website about the guiding: http://burung-nusantara.org/service/loontour/. You can contact them.